Many thanks to Carolyn Charles, retired Park High teacher and communications officer, for much of the following information. Also see Public Schools Timeline. The building that some know as St. Louis Park High School, others as Central Jr. High, and still others as the home of the Spanish Immersion Program, has a long and interesting history. There are basically three sections as the building exists now: west, middle, and east. The new school was a model of the latest ideas in school planning, offering every facility for work and play. The classrooms were large, with huge windows designed to take advantage of sun and air. The seventh and eighth grades had their own home rooms, but for the high school there was a spacious assembly hall with classrooms opening off of it. There was a sunny library for reference work, sewing and cooking rooms, a horticulture room with a greenhouse, manual training [woodworking] workshops, chemistry lab and a big auditorium for programs, plays, gym classes and basketball games. On the grounds were tennis courts at the rear. (“The Honorable”) T.B. Walker donated Block 17 for the new school, and Block 16 (five acres) for experimental agriculture. At the time there was a proposal to name the building Walker High School, but it was not to be. Walker also donated Block 33 in front of the new school for an athletic field. In the winter, the Village would flood the area for a skating rink. That site was eventually taken in the early 1930s when Highway 7 was built. 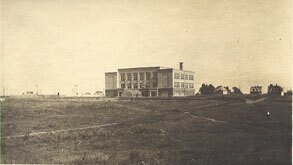 Another picture of the 1914 building, taken in the ’20s. Highway 7 wasn’t built until 1934. In the fall of 1937 Mr. Christy (presumably C.Ed.) and Mr. Yeager presented the school with a new scoreboard. The school board and the Village had renovated the athletic field as well. In May 1938 the Echo-ette reported that there were 330 students at the Jr. High School. 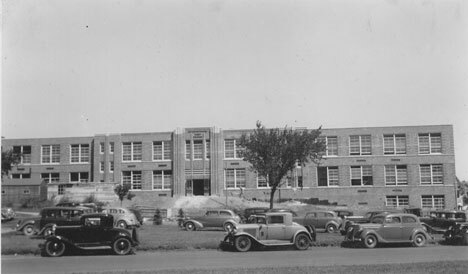 In 1941 a new Industrial Arts wing was added to the north side of the 1914 building. In the summer of 1945 the gym was remodeled, making an upper portion into six classrooms (the ceilings were 25 ft. high). A nurse’s office was also built between the old and new building. General Contractor was Leck Construction Co. of Minneapolis. Somehow the War Labor Board was involved with making the decision, perhaps turning down a request to add on to the building. In the summer of 1946 the second floor of the Industrial Arts wing was turned into 8 temporary classrooms. In 1952 the library was moved from this building into the new Eastern Addition. The entire second floor of the 1914 building was devoted to home economics, including classrooms and a model home with a living room, dining room, bed room, and laundry room “to complete all phases of home economics,” according to the Echo. The music room was doubled in area and a new art room added. The 1914 building was demolished in the spring of 1962. 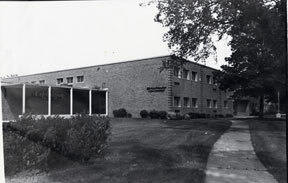 In 1962 the original 1914 building was replaced by a new wing on the west side, designed by architect Bissell and Blair. Funds for the construction were part of a $1,053,000 bond issue that was approved in December 1960. It was described as a $900,000 remodeling and rebuilding job designed to accommodate 800 more students. Construction started in mid 1961. The new wing included five science rooms, 8 general classrooms, 3 art rooms, a special activities room, band room, vocal room, girls’ phy ed facilities, visual aid office, nurse’s quarters, and a multipurpose room for speech, dramatics and visual aids. The project also included the remodeling of the offices of the principals and counselors and the improving of facilities for industrial arts. To accommodate the construction, 400 freshmen were reassigned to the Sr. High and 300 went to Westwood in 1962. The school opened in the fall of 1938, and the Dedication Ceremony was held on October 26, 1938. Since there were more Junior High students at the time, some High School students remained at Lincoln that first year, which was a disappointment to some. The 1914 building became the Junior High. The two were connected by a passageway, and when the building was first occupied, the first floor wasn’t ready so students had to enter by way of the Junior High. 150 students occupied the eight classrooms on the second floor. Central in 1938, courtesy Earl Ames, Jr. The 1938 Park directory boasted that the auditorium could seat 1,000, with a stage 56 x 106 – the largest in the Northwest. It was put to use on November 19, 1938, when a “Gala Performance” benefit was held to raise money for a grand piano. The Dedication Program promised that “The finest talent in the Northwest will entertain you and your friends.” The concert was sponsored by Mrs. Louise Lupien Jenkins. 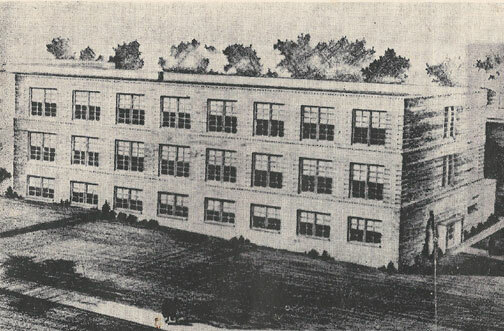 The Jr. High Echo-ette reported in May 1938 that the new high school cafeteria, with a capacity of 250, was located in the southeast corner of the basement. In the northeast corner of the cafeteria was a private dining room for teachers, which could also be used for private dinners accommodating 24 people. The kitchen featured a large gas stove with ten burners, a double oven, built-in refrigeration and a steam table for at least four large kettles. The ciling had acoustic tile. The floor area of the main cafeteria was 60 by 44 feet, with tables that could be locked together and used as ping pong tables. The athletic field cost $250,000; $122,400 was paid for by the Public Works Administration (PWA). The WPA was involved with other school-related activities. Participants canned fruits and vegetables to be used for winter hot lunches. The WPA furnished the work and the school furnished the food. County schools were also the beneficiaries of WPA labor to fix up their properties, with some receiving new basements, a new water supply, new roofs, furnaces, etc. Most of the work in the Park consisted of painting and redecorating. A new Industrial Arts building was dedicated on October 7, 1943, marked with an Open House. In 1946-47, 16 rooms of elementary children Grades 4-6 were crowded into the junior-senior high school. In the fall of 1948 the walls of Park High were painted in pastels. Contracts totaling $478,750 for a new wing of the junior-senior high school building were awarded in November 1951 by the school board. The St. Louis Park High Echo reported on November 20, 1951 that Matthew Levitt and R.C. Fernstrom, school board members, flew to Washington to present an application to the National Production Authority for the necessary steel and other metal that was being rationed because of the Korean War. The application was prepared by the architects, Haxby, Bissell and Blair. The application was approved and construction started on November 16. Orville E. Madsen of Minneapolis was awarded $358,600 for construction and for installation of acoustical tile in the present junior high building. Harris Bros. was awarded $123,950 for plumbing, heating, and electrical work. Conceptual drawing of east wing, as published in the Echo in November 1951. The addition was designed to include an enlarged lunch room and kitchen, teachers’ dining facilities, faculty lounge, student council office, new boiler, and 11 classrooms, making a total of 55 classrooms in the school. The expanded junior-senior high was to accommodate between 1500 and 1600 pupils. The existing library, which served the entire community, was moved to the first floor of the main addition and included a new conference room. Four classrooms faced the library. An additional seven classrooms were on the second floor. The old library space, on the second floor of the 1914 building, was converted to home economics rooms. To accommodate construction, students had to make sacrifices. First, they were kicked out of the lunch room and had to eat in their home rooms, or outside when it got warmer. Cooks were transferred to other schools. Then, their summer vacation started two weeks early, but they had to attend school on other normal holidays, including three days of Easter vacation. Even with the shortened schedule, they were two days above the 170 day State minimum for the year. The new wing featured pastel color schemes, formica-topped desks and blond wood for a look of modernism. The cafeteria was not immediately available as school opened in the fall of 1952, but two soft drink machines were placed in the junior and senior high school buildings, dispensing Coke and orange drink. The expanded cafeteria seated 500 students at 50 “beautiful formica-topped tables” surrounded by 10 “comfortable steel folding chairs.” In keeping with the color scheme, the kitchen walls were done in a peppermint green with darker green tile on the floor. But in 1953 the class size was well over 100. Conditions were so crowded that in the 1954-55 and 1955-56 school years, students attended school in double shifts. 1331 junior high students attending class in the morning and the 881 high school students attending class in the afternoon. During those years there were almost 2,500 students in the building. 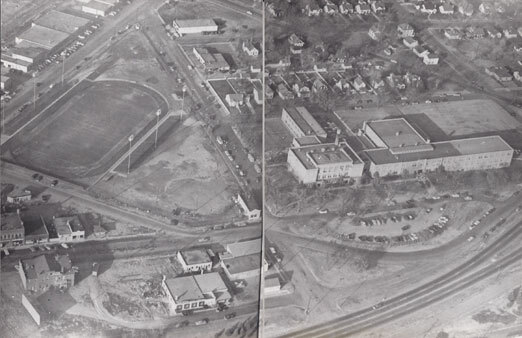 Aerial photo of Central in 1954. Note 1914 building on the west, middle and eastern sections. At far left are the buildings of Walker Street, once Park’s main street. The 1956-57 school year saw the opening of the new high school on 33rd and Dakota. The Walker Street building became St. Louis Park Jr. High. Westwood Jr. High was built in 1959. Approximately 1,200 pupils attended Central Jr. High in the 1963-64 school year. The pool was added in 1967. Central’s athletic facilities were remodeled in 1977. In 1980, with declining enrollments, the two junior highs were merged and located at Westwood, which became St. Louis Park Junior High School. A farewell celebration was held on May 19, at which former students and teachers met and heard remarks from former principals and superintendents, including Stan Wignes, Harold Enestvedt, Howard Buska, and Michael Hickey. After closing as a junior high, Central was used for a community center. In 1990, ten years after closing, Central staff met for a reunion at the VFW. The Historical Society has a DVD of that event. In 1992 Central became home to the Park Spanish Immersion Program. In 2009 Central staff met to note the 50th anniversary of the school’s opening. Thanks to generous donations, particularly from Mrs. Laura Hanks, the SLP Historical Society has copies of Central Jr. High yearbooks for the years 1969-1970 through 1979-1980. We believe this is a complete set. The Historical Society also has a a copy of a literary publication called “Centricity” from 1972.